Silhouette Not Cutting Vinyl Straight? Troubleshooting and Tips to Fix It! If you've ever gone to cut a piece of vinyl longer than the mat only for it to slip half way through you know how frustrating it can be to waste so.much.vinyl. This is the main reason I always say use the mat, when you can. (I suggest a 24" CAMEO mat if you're a CAMEO owners. I have the Portrait also, and while there is no 24" mat on the market for the smaller machine, I have successfully taped two Portrait mats together to use it for larger cuts. ) Sometimes, on very long cuts, however, it's still not possible to use a mat. When you don't use a mat, there's a high risk of the vinyl slipping. To understand why your the vinyl is not cutting straight, you first must understand what makes it cut straight. A straight and squared leading edge is crucial. A straight edge isn't enough. If that straight line is cut at an angle, it may be a perfectly straight diagonal straight, but the corners won't be taken under the rollers at the same time and that can become a problem while cutting. Having an equal amount of vinyl under each roller helps keep the vinyl straight. If the left edge is fully under the roller, but the right edge is only partially under the roller there is a greater chance that as the vinyl feeds down the piece it will slightly shift out from under the right roller and when the vinyl isn't under both rollers it will slip and the cut will be off. This goes hand in hand with No. 1 because if the vinyl isn't fed into the machine squared it will not feed down the vinyl piece evenly, which will almost always lead to it gradually coming out from under one of the rollers. 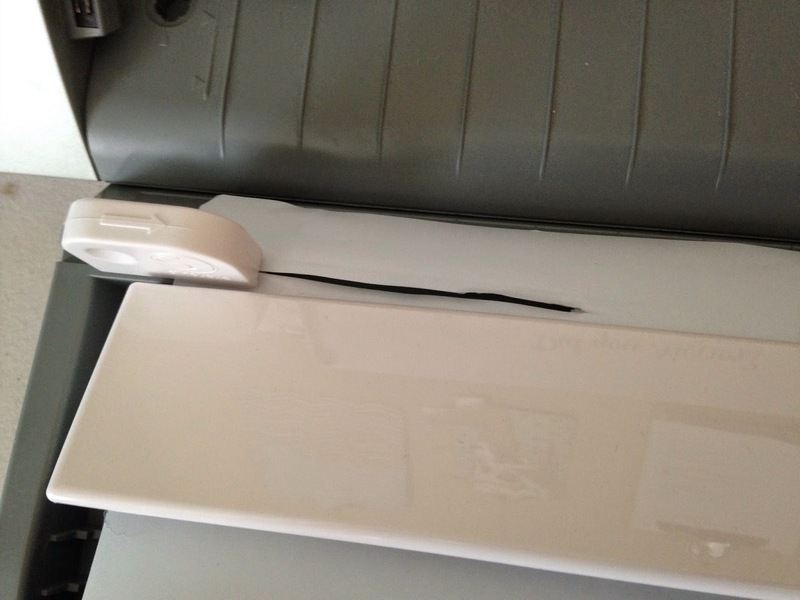 If the weight of the vinyl piece being cut isn't supported it can pull causing the vinyl to slowly slip. This isn't a big problem when the piece of vinyl is small or when it's on the mat, but when you have a long piece of vinyl, if it's hanging down while cutting it can cause the vinyl to drift off course. Even placing the machine on the floor and having the vinyl lay straight out can be helpful. 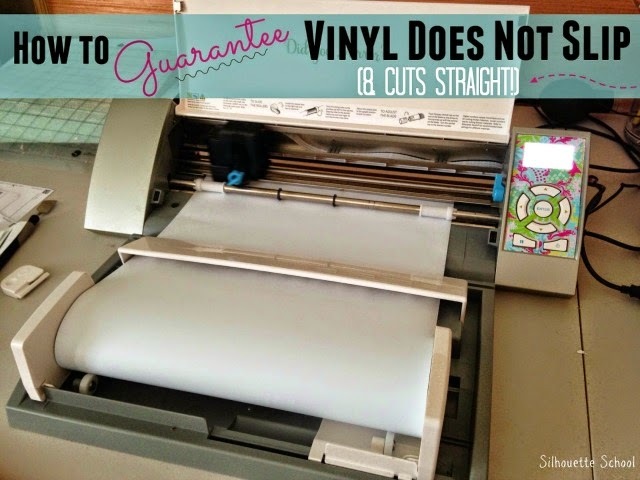 Although you still run the risk of the vinyl not cutting straight if either or both #1 or #2 are issues. So...how do you prevent vinyl from slipping and make it cut straight? The easiest and most effective way is to use the Silhouette Roll Feeder. 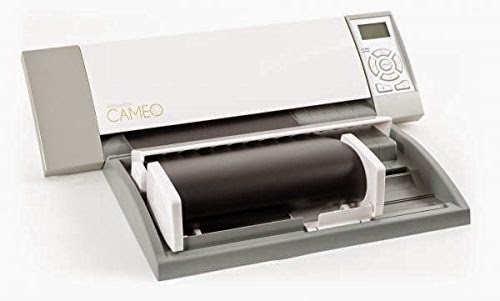 The Roll Feeder is an attachment that can be used with the Silhouette CAMEO, Portrait or SD to address all of the above issues. It can be used with 9" or 12" rolls of vinyl. The roll feeder works by not only supporting the weight of the vinyl, but also because of the arms that hug the vinyl, it keeps the vinyl straight as it feeds down the piece. The Silhouette Roll Feeder is usually sold for around $40. I purchased mine on Amazon when it dropped to $32. Typically, I don't buy things that aren't on Prime, but this thing is rarely available on Prime so when the shipping dropped to around $3-4 also I finally gave in. To use it what you want to do is first put the small 'feet' of your machine (left below) into the cutouts on the Roll Feeder (right below). Each cut out on the Roll Feeder is marked for which the machine that should fit into the spot. To prep your vinyl, pull out a small section of the roll and flip it over so you can see the grid lines on the back of the vinyl. Using scissors, cut a really straight line across so you have a perfectly straight leading edge. The Roll Feeder comes with a cutter, but it leaves much to be desired as you can see here. Flip up the two white arms on the roll feeder. Place your roll of vinyl on top of the white rollers and between the two white arms on the feeder. The vinyl roll should be positioned so that the leading edge is coming from over top the roll. You'll likely need to move the right arm in so it's snug against the roll. In the above picture you can see there's a gap. Below there is no gap between the right arm and the vinyl roll. You'll also have to move the right white roller on the CAMEO to the left so that it catches the vinyl. If you leave it where it is, the vinyl won't go under the right roller. Thread the edge of the vinyl under the white flap-looking part of the Roll Feeder. Making sure the left edge of the vinyl is lined up with the left most marking on the machine (CAMEO) and that both sides of the leading edge are touching both rollers, choose the option to "Load Media." BE SURE BOTH THE RIGHT AND LEFT EDGE FEED IN AT EXACTLY THE SAME TIME! If the left edge goes first and the right is even slightly off unload the vinyl and try again. Now you can cut the vinyl as you normally would. 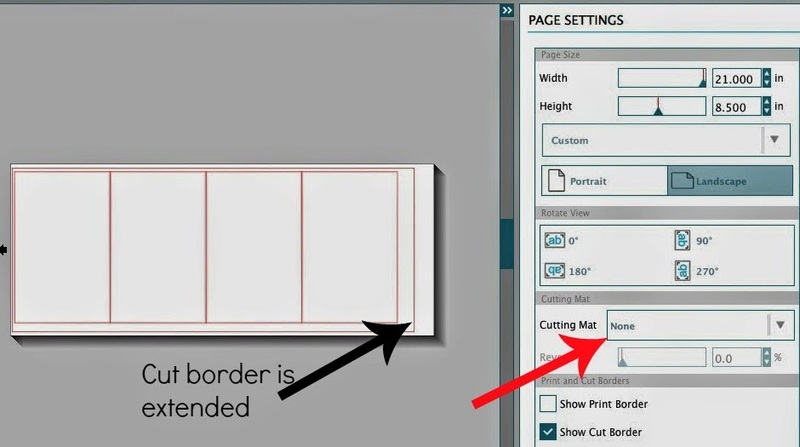 Be sure, in Silhouette Studio, to go to Page Settings and change the Page Size options to account for the length of the design and select "no mat". The Silhouette Roll Feeder will keep the vinyl straight, take the weight off the vinyl by rolling it back and neatly hold the roll of vinyl as it works its ways through cutting the design. And there you have it: no more wasting vinyl because it slips while cutting! instead of taping two mats together, you could also get a Cameo mat and cut it down to the right width (can easily be done with an exacto knife). I have done this with a regular mat because I accidentally bought the wrong one when shopping online.... Cover the right edge with tape to make it unsticky. Works fine! Once again you are my Silhouette Angel! My roll feeder came without instructions about how to use it with the machine. That little white tab left me wondering what it was supposed to do. Thankfully, you had me covered! Yay Melissa! Is there a limit on the size roll this will accommodate? Wondering if this would support the weight/size of a full roll of 813 (12"x50 yards? You shared useful post. Thanks for sharing such a useful post. I wasted several rolls with misplaced confidence in the Roll Feeder. The only thing I can attribute my bad cuts to is imperfect loading, but you don't know it's bad until several feet into the cut. After reading this post I purchased the feeder for my large rolls of HTV (continuous cuts of the same design for vacation rental bags), and need your advice on an issue I'm having with it. The vinyl is still slipping about halfway through the job (so it waste's a lot of vinyl since I don't catch it right away). The issue seems to be a result of when the the vinyl is fed backward toward the roll.... it just bunches out past the back instead of rolling back up. When its pulled back through it starts to move out of alignment and continues to get worse as its fed back and forth through the rollers. I'm at my wits end & really don't want to cut all the vinyl into 24" sections to use mats when I've got 100 bags to do, ya know? Any recommendations on how to prevent this? ?